PETALING JAYA: Property values of high-end condominiums in Kuala Lumpur City Centre (KLCC) and Mont’Kiara are expected to retrace by up to 20% to 2006 levels by the first half of next year, according to Kenanga Research. The average capital values of KLCC and Mont’Kiara in 2006 were RM943 and RM466 per sq ft respectively, compared with RM1,128 and RM564 psf respectively currently. If the Kenanga Research projection is right, this would mean the luxury residential segment in these prime locations could fall by as much as 16% to 20% over the next year, on top of a 6% to 10% depreciation since their peak. 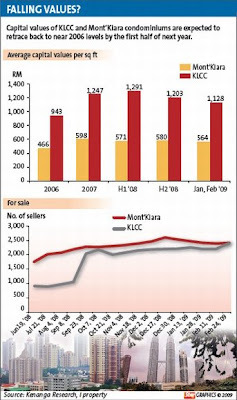 Average prices in KLCC peaked at RM1,291 psf in the first half of last year; for Mont’Kiara it was at RM598 psf in 2007. However, the research house in its report on Monday said property prices in these locations could stabilise if the economy recovered earlier and/or investors had strong holding power. The research house also expected selling pressure to accelerate when an additional 11,000 condominium units are completed in the next two years, with 60% of these units in the KLCC area. It should be noted that the number of people putting up their properties for sale should not be used as a measure of actual transactions. “With the rental opportunities and capital values in a downtrend, property investors will be pressured to unlock their cash to fund other investments,” it said. Khong & Jaafar Sdn Bhd managing director Elvin Fernandez said due to the economic downturn, property values at Mont’Kiara and KLCC could return to levels that may be sustained by rental returns. “How low they will go and whether they will overshoot on the downside will depend on the severity of the downturn, going forward,” he told StarBiz in an e-mail. Fernandez noted that prices in these locations had appreciated steeply between 2005 and 2007, and to sustain these high prices, the rentals had gone up in tandem. “But there was a constraint in the charging of rentals simply because the expatriate community was not about to pay or couldn’t afford such rentals,” he said. OSK Research analyst Mervin Chow expected at least a 20% downside risk and prices to bottom in 2010. “About 30% and 40% downside (in property value) is a reasonable expectation,” he told StarBiz. He said KLCC and Mont’Kiara condominium prices had already come off by 10% to 20% since late last year. Some properties in these areas, however, still enjoy capital values close to their peaks last year. KUALA LUMPUR: Sime Darby Bhd’s property division has, as of Sunday, generated RM161mil in sales, exceeding the expectation of the company since the Parade of Homes campaign was launched on March 6. Attributing the surge in sales to the benefits given to home buyers, Sime Darby Property Bhd said the impressive sales haul was also a sign of a resilient property market. In a statement, Sime Darby Property managing director Datuk Tunku Putra Badlishah said the main factors contributing to the strong sales were the Parade of Homes’ exclusive benefits, which included an interest rate of base lending rate minus 2.3%, special downpayment scheme, and no interest charged during the construction period. “In addition to the very attractive financial packages offered, we are also very pleased to note that our customers are buying because of our good track record, quality products, reputation as a reliable developer, and most importantly the trust and confidence in the Sime Darby property brand name,” said Tunku Putra Badlishah. The Parade of Homes campaign is being held in conjunction with MAPEX 2009 and continues until June 15, covering both residential and commercial properties in Sime Darby’s 10 townships. Sime Darby Property’s first Parade of Homes campaign was launched in June 2008 and generated sales of RM246mil in nine days. The second campaign in November 2008 generated over RM146mil in sales. Sime Darby’s freehold properties range from affordable homes to high-end residences in townships in Subang Jaya, Bukit Jelutong, USJ Heights, Bandar Bukit Raja, Ara Damansara, Denai Alam, Melawati, Nilai Impian, Planters’ Haven and Putra Heights. Sime Darby Property is also organising a property showcase from April 3-12 at the Sime Darby Convention Centre. Permodalan Nasional Bhd (PNB) has confirmed it is finalising a merger to create a large property group and says it may undertake an initial public offering when the stock market recovers. Business Times had reported that PNB was combining Island & Peninsular Bhd, Pelangi Bhd and Petaling Garden Bhd under one roof to squeeze more profits from them. The three firms were taken off the stock market by PNB a few years ago, allowing the merger to be done out of investors’ sights. President and group chief executive Tan Sri Hamad Kama Piah Che Othman said the move by PNB to make its companies more efficient is an ongoing exercise. “Not only these counters, but many counters also. We have to keep on looking at things so that we can improve from time to time,” he said at a briefing in Kuala Lumpur yesterday. As for raising money from an IPO of the merged entity, Hamad Kama Piah said: “It is possible … we have to make sure the right time and so on”. Based on information from the Companies Commission of Malaysia, the merged entity would have a revenue of RM1.31 billion for 2007. This means that it could rival SP Setia Bhd, Malaysia’s most valuable property developer, which made RM1.33 billion revenue in financial year 2008. The property merger is due to be completed next month. It would probably be the second mega mer-ger under the PNB group of companies. In 2007, the state-run fund manager completed the merger between Sime Darby Bhd, Golden Hope Plantations Bhd and Kumpulan Guthrie Bhd to create the world’s largest listed plantation group. PETALING JAYA: Permodalan Nasional Bhd (PNB) will merge the property companies it has taken private and the exercise may be completed by June, according to a source. “It is true the merger plan is on,” the source said. “Once the merger is completed, PNB will have one big property company that specialises in investment and township development and (it can) re-develop the massive landbank owned by these three companies. “It is still a big question whether these companies will maintain their names after the merger,” the source added. PNB president and group chief executive officer Tan Sri Hamad Kama Piah declined comment on the matter. PNB wants to merge the property companies it had taken private, namely Island & Peninsular Bhd (I&P), Pelangi Bhd and Petaling Garden Bhd, to create “specialisations” in certain segments of the property sector and to unlock the potential of its landbank, according to the source. The merged entity would reportedly generate about RM1.31bil in revenue. I&P, the biggest of the three companies, is highly experienced in township development. Its projects include Bandar Kinrara in Puchong, Taman Setiawangsa in Kuala Lumpur, and both Taman Inderawasih and Desa Mutiara in Penang. It has a massive landbank of over 5,263ha in the peninsula. Pelangi is a renowned property developer in Johor with residential and commercial developments. The company’s townships include Taman Pelangi, Taman Perling, Taman Rinting and Taman Pelangi Indah. Its commercial developments include Plaza Pelangi, Pelangi Leisure Mall, Perling Mall, Menara Pelangi and Pelangi Golf Driving Range. Petaling Garden was a pioneer property developer in Petaling Jaya in 1958. Its remains focused on property development and has sold more than 10,000 properties, located mainly in the Klang Valley. PETALING JAYA: IOI Corp Bhd has extended the deadline of its takeover offer for the remaining shares it does not own in IOI Properties Bhd (IOI Prop) by 14 days to March 31, as the acceptance level of 89.68% is not enough to trigger a compulsory acquisition of the latter. Under the regulations, shares from minority shareholders can be compulsorily acquired by IOI Corp if the company manages to obtain more than 97% of equity in IOI Prop, according to Minority Shareholder Watchdog Group (MSWG) chief executive officer Rita Benoy Bushon. “The company needs 97% to trigger a compulsory acquisition which would subsequently lead to a de-listing. “Should it fail to get this by March 31, it has two choices. It can either write to Bursa Malaysia to seek a delisting or it can go through an EGM,” Bushon told StarBiz. “At the EGM, if 10% dissent, its proposals will not go through,” she said. “IOI Corp has already acquired 76% of the shares in IOI Prop. For the compulsory acquisition to take place, it requires 90% of the outstanding offer shares of about 24%, which works out to be about 21%,’’ she explained. She said under normal circumstances, a reasonable price to minority shareholders should be at net tangible asset per share. “Given current economic conditions, the discount to IOI Prop’s current net tangible asset per share which is about RM3.90 now, should not be too steep,” Bushon said. “Boustead Properties Bhd was accorded a premium to its net asset per share when it was taken private last year,” she noted. In a filing to the stock exchange, IOI Corp said it did not intend to extend the closing date of the offer beyond March 31 and in addition, had no intention to raise the offer price. IOI Corp had on Feb 4 proposed to privatise IOI Prop, its property arm, at a consideration of RM2.598 per share. The plantation giant made a voluntary takeover offer for the remaining 24% stake it did not own in IOI Prop, payable through a combination of shares in IOI Corp and cash. Under the buyout scheme, IOI Corp offered IOI Prop minority shareholders to voluntarily swap one IOI Prop share for 0.6 share in IOI Corp plus 33 sen cash. Shares in IOI Prop closed eight sen higher at RM2.50 while IOI Corp closed six sen up at RM3.80 yesterday. LONDON: As Dubai scales back plans to build a waterfront development twice the size of Hong Kong Island, 30,000 workers off the coast of Doha in Qatar are constructing a US$14 billion (US$1 = RM3.67) luxury residential project called the Pearl. The first residents will move into condominiums costing as much as US$1.4 million on a man-made island this summer, and boutiques including the likes of Sonia Rykiel and Stefano Ricci are already doing business on the marina looking onto the Persian Gulf. From the quayside, where yachts are moored, building sites are visible in the distance with cranes stretching up into the sky. Gas-rich Qatar, the Gulf's fastest-growing economy, is spending more than US$100 billion in the next three years on projects including a new financial district and international airport. This comes as Dubai suffers a real-estate crash spurred by its dependence on banking and tourism, and the region's oil-producing economies, such as Saudi Arabia, dip into reserves to avoid recession. "Qatar doesn't seem to have any problems; the money is there," said Lionel Scharly, chairman of the French luxury design company Scharly Designer Studio. After visiting Dubai in December and deciding not to do business, he is bidding for work at the Pearl and plans to open an office in Doha. "In Dubai, everyone is talking about the crisis," Scharly said from Paris. A sheikhdom smaller than the US state of Connecticut, with a population of about one million, Qatar last year had the world's second-highest per capita income, at US$101,000, after Liechtenstein. It is hurt less than neighbours by the slump in oil prices to US$47 a barrel, from more than US$147 last July, because of a bet its rulers made 25 years ago: natural gas. WASHINGTON: US home construction starts and permits saw a surprise jump in February from 50-year low levels in a positive sign for the moribund home market at the epicentre of global financial crisis. Housing starts - or privately owned new homes on which construction has started - soared 22.2 per cent to a seasonally adjusted annual rate of 583,000 units after seven months of decline, the Commerce Department said. It was much higher than the revised January estimate of 477,000 and consensus forecast of 450,000. Permits to build new homes, an indicator of future activity in the housing sector, rose three per cent to a seasonally adjusted annual rate of 547,000 in February, the department said. It was above the revised January rate of 531,000 and consensus forecast of 500,000. Starts and permits were at their lowest pace in January since the Commerce Department began tracking the data in 1959. A home mortgage meltdown triggered financial turmoil and plunged the world's biggest economy into recession in December 2007. Analysts were baffled by the rise in housing starts led by the notoriously volatile multifamily segment and aided by weather conditions, saying they do not see concrete signs of recovery in the housing market yet. The real good news, they said, was the slight recovery in single-family building permits - for the first time in nine months - and the stabilisation in single-family starts. The leap in starts propelled by an 82.3 per cent surge in multifamily sector reversed almost all the drop in starts over the previous three months, analysts noted. "We see no specific factor that might explain this jump; multifamily starts are always noisy but this is exceptional," said Ian Shepherdson of High Frequency Economics. "With new home sales still falling and the (inventory) at a record (high) there is no reason for homebuilding to rise," he said. "This is a temporary rebound, not a recovery, though it likely means the post-Lehman crash is over." The September 2008 collapse of Lehman Brothers, one of Wall Street's most established investment banks, on the heels of the home mortgage crisis sparked turmoil on financial markets across the world. The latest figures showed that the increase in housing activity was concentrated in the wealthiest Northeast region, where starts jumped 89 per cent. Analysts were also unsure whether this month's gain - even at a more measured pace - can be sustained in March. The February figures were "clearly not a sign of an upturn in the sector but could be at best considered as a first sign of stabilisation," Marie-Pierre Ripert of Natixis said. "We will wait for these data to be confirmed in the months ahead before changing our view on the real estate market," Ripert said.